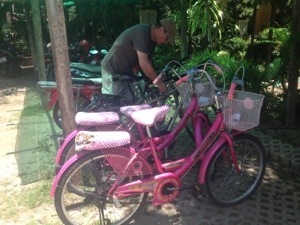 It was clear we should start the Bangkok to Chiang Mai bike ride in Ayutthaya. Mike D did it from Bangkok but suggested it was crazy. You might say catching the train is cheating; but that is only if you consider staying alive to be cheating. 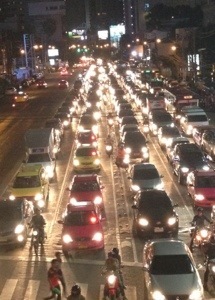 In Bangkok the pavements are fair game for any small vehicle and the roads are akin to a war zone. This is a place where size matters and not a place to try to balance on a bike you have never ridden, using panniers and carrying luggage, which you have never done, amid traffic customs you have not experienced. 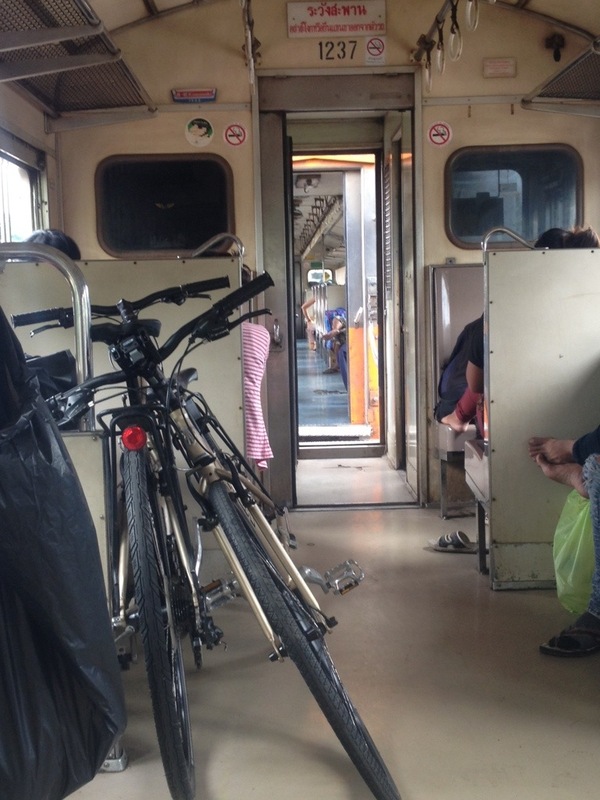 So the bikes were transported to Hua Lampong Train Station by Siam Taxi Van and loaded into third class. Never have I travelled so cheaply (the bikes, however, were many times more expensive at 100THB per bike – still nothing to grumble at though). It would have been an enjoyable ride, had I not been worried about disembarking. It was somewhat olde worlde with the open windows providing the ventilation and the open spaces between the carriages where Indiana Jones would have been chased onto the roof to do mortal battle with some villain. Now people risk their lives by standing out there having a fag. 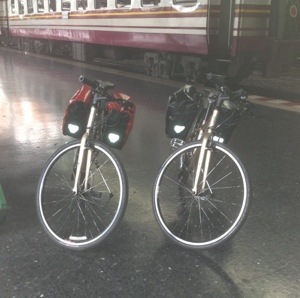 This is a bicycle tour, the operative word being tour as much as bike, so I wanted to stay in places of interest. Ayutthaya appeared interesting; once the capital of Siam and a major trading port before the city was sacked by an invading Burmese army in 1767. Ayutthaya is almost off the wat scale and one of the things to occupy tourists (didn’t I say I wanted to get away from the tourist trail?) 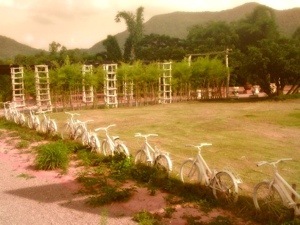 is to hire bikes and cycle the city, visiting old wats and new. It seemed obvious that already having bikes we should spend some time there, so we stayed for two nights. 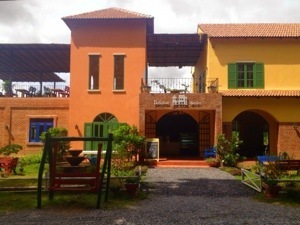 In Ayutthaya, at the beginning of our ride, several themes began to emerge – punctures, wats, wats and wats (including cockerel wats), karaoke and dogs – each to be endured, admired or avoided. Sorry? What did I say about wats? So, perhaps I was angling for my full wat dose: my wattage. In any event there were no wats on day one. 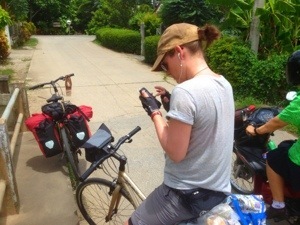 Negotiating the howling dogs at the train station and the slightly less intimidating traffic, when we arrived at Luang Chumni Village we were asked to wheel our bikes through a waste land. After unloading we prepared to head out to investigate the ‘island’ and buy a puncture repair kit and I found I had my first flat. One new inner tube of three used and more self-flagellation about having forgotten to buy the puncture repair kit in the first place. That was my first realistic Thai experience; trying to buy a puncture repair kit from a very rudimentary bicycle shop, across a huge language language gap and with several Thais watching. I couldn’t manage a whole kit, but I did achieve four patches and some glue for 20THB. On day two we set out to explore the floating market and the wats. Close to Bangkok, steeped in some history and grandeur of days gone by, Ayutthaya still draws the tourists. Even though it is low season there was much evidence of that. Tourists meandered the roads on bikes. Their coaches and mini vans lined the streets. 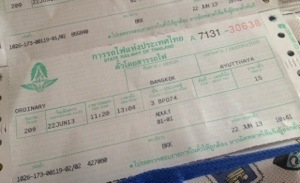 And there was still that Thai attitude to tourists that I had so longed to escape from in the south. Take the floating market (no longer a place where trade takes place on junks, just another t-shirt tourist trap), we were asked to pay 20THB to park our bicycles on the street. Never in my (not that extensive) cycling career have I been asked to pay to park my bike; that is one of the beauties of bicycles, is it not? No fuel, no parking fees. No, thank you; we dumped them outside the 7 Eleven. On the same day we paid a visit Wat Phra Mahathat, central to the island and opposite a food market. After having had my feet savaged by ants while parking my bicycle (for free), I was not in an understanding mood. A sugary drink helped but could not rescue the situation when I saw the ticket booth for the wat; in plain English there was a ‘Foreigner’s’ price. I watched throngs of tourists, clearly happy to pay this, trailing from the booth towards the ruins. No. Interpreted in its most negative light (a skill of mine), it was a blatant declaration that the foreigners or tourists were there to be taken advantage of. We still saw wats. 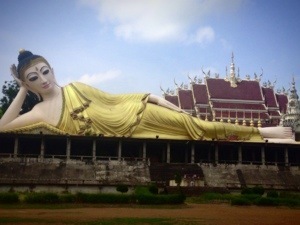 In Ayutthaya it is hard not to. And as we cycled further afield we noticed that as well as wats there were dogs (I had encountered many dogs in the south of Thailand and up until then was unafraid). In the road, under cars, enjoying the shade of a tree or a nook of a wat; but one thing was clear, they had the run of the place. Strolling around Wat Kudi Dao a whole pack trotted and circled, outside the low walls, one with a mouthful of road kill. Other dogs appeared and joined in. They were some distance away when we entered the ruin, until one dark one (small, but in my mind resembling a hound of hell) slunk inside. We watched from the stairs of an old pagoda as the dog began to wind its way through the fallen stones. The question really was, were these old bricks his territory? Sadly I left my khaki shorts, white vest and huge gun in Ao Nang. I felt like I was on the set of Tomb Raider, but with none of Lara Croft’s bravery or ammo. 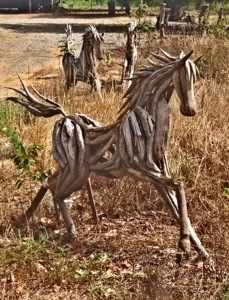 Quietly we tiptoed across the court yard, retreating under the dog’s narrowed eyes. Dinner was a marked contrast to the day’s exploitation and dereliction. We had scoffed on the train while reading a Lonely Planet paragraph on Gahn Glooay. Effectively a bar/restaurant/karaoke venue; although from the look of the female staff it appeared to have a fourth function. Purely by chance and driven by hunger, we stumbled in there. Never have I been more uncomfortable as when, having asked for Singha Beer, the staff hovered pointing out what we should order. My brandished two fingers and menu pointing, were not understood. But to my surprise, when my hastily ordered food arrived it was some of the best I have tasted in Thailand. And the karaoke? Well it wasn’t great, but hey, the people in there were having fun and there were no dogs. The final theme was kindness. 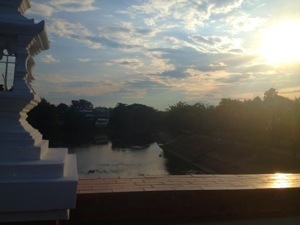 While Ayutthaya left a spicy-sour taste in my mouth, Luang Chumni Village (at 1000THB per night) was a truly lovely stay. The owners leant their pump (after the wasteland incident), gave towels to dry the bikes and prepared a lovely breakfast; the staff were friendly and kind. 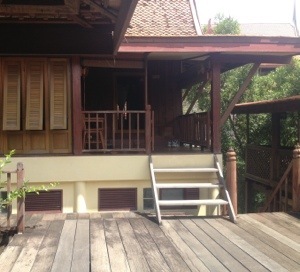 The rooms, rustic wooden stilted things – some with the bathrooms located under individual houses – were a delight and are surrounded by well tended garden and what resembles a small moat. Ok, so we shared the room with a lizard that had the awful habit of chattering in the dead of night night but as I was later to find out, he was to be the first of many. 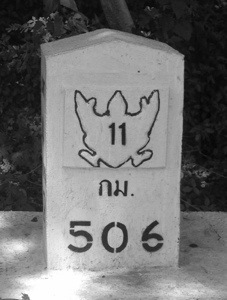 I left there with regret and some anxiety about the 80km of road to the city of Lop Buri. 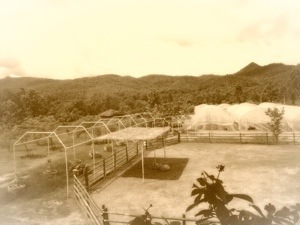 Lizard home stay, I can’t recommend it enough. 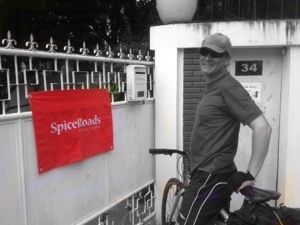 Having done some research and read several blogs (Mike’s Travels in Asia being one of them), I decided it was not safe to cycle out of Bangkok. Train from Hua Lampong Train Station to Ayutthaya. A bargainous 15THB for people, a not so bargainous 100THB for the steeds. The first puncture and the strangest dining and Karaoke experience, ever. 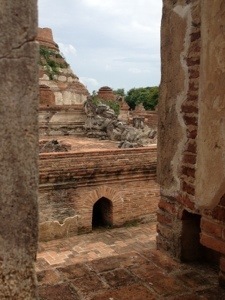 A day of consolidation in Ayutthaya. Spent taking in the floating market (a heavily tourist-driven attraction where a woman tried to charge 20THB each for parking our bikes – er, no), the wats (complete with special ‘Foreigners’ price – again, er no) and avoiding the roving dogs. Hot hot hot. Sweating, squinting to read the GPS on my iPhone and more dog avoidance. And another strange dining experience at The Broiler, Lop Buri. After GPS said ‘no’ we made our own route. 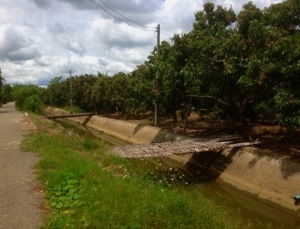 This was a better day of cycling, winding through rural villages, stopping occasionally to snap a wat and buy 10THB orange drinks at the side of the road. 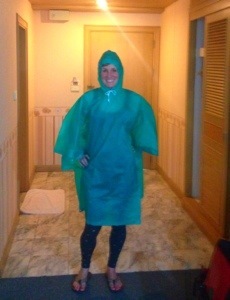 Beautiful greens, soggy paddy fields and big smiles. Despite the plan for the longest ride so far, woke up, took in the grey sheets of rain against the silt brown of the Chao Phraya outside the window and booked into the hotel for another night. Once again nearly attacked by dogs. Getting into it now. Arrival at the most striking town so far. It still retains its strong connection to the Sake Krang River, Delightfully exudes an Old West feel with its wooden shutters and wide dusty streets and has a huge amount of bike shops. Most of all, it is a friendly place.